Wants to get updates about latest Amazon Deals? Now you can get all Amazon Deals direct into your iPhone, Amazon has finally launched "Amazon Deals", a free iPhone App that provides you an overview of the new and latest daily deals from Amazon. From this iPhone App, you can monitor deals and even act on them, purchasing items from Amazon directly from your iPhone. Features include browsing through active deals or upcoming Lightning Deals, setting alarms for individual deals and receiving category-specific notifications (with support for Apple’s push notifications). You can also share deals via e-mail, Twitter, Facebook or SMS. Amazon seems to be getting serious about offering users a great mobile experience. It has recently launched Price Check, a price comparison app for the iPhone that allows users to easily compare in-store prices with the prices on Amazon. 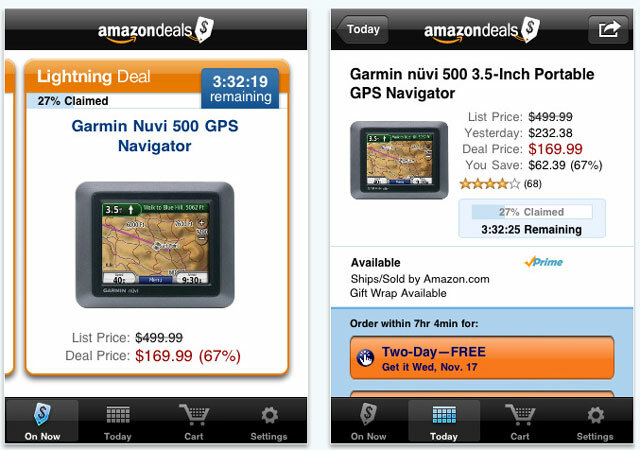 You can find this Amazon Deals iPhone Application on iTunes or learn more about it over at www.amazon.com/dealsapp.